ScotRail has decided to prohibit the carrying and consumption of alcohol on its services between 21:00 and 10:00, starting on 20 July. The move was welcomed by police and the government. Drunk people would be banned from travelling on trains under the crackdown. Transport police have dealt with at least 260 drink-related incidents in the last six months, while an increasing number of trains have also been delayed, because of anti-social behaviour. The overnight Caledonian Sleeper train to and from London is exempt from the ban. ScotRail managing director Steve Montgomery, said: "Anti-social behaviour fuelled by alcohol has no place on our trains or at stations. "It's time to call a halt on the irresponsible minority who spoil journeys for the majority. "These individuals disrupt services, abuse staff and fellow customers, and cause accidents." Justice Secretary Kenny MacAskill, added: "We want everyone to enjoy themselves on nights out, but consideration for others is also vitally important. "A journey home on a train shouldn't be a worrying or upsetting experience for any passenger." Alcohol is already prohibited on certain services during football, rugby and other special events. 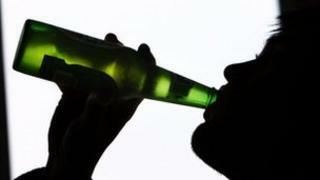 The wider ban came in the wake of responses to a consultation on the future of train services, which backers said showed clear concern from passengers about travelling with drunk people. British Transport Police area commander Ch Supt Ellie Bird, said: "Crime on Scotland's railways is at a record low - however, combating anti-social behaviour and disruption to the rail network remains a priority for us." "The consumption of alcohol is prohibited on other forms of public transport, such as buses, and trains should be no different." ScotRail is launching a four-week campaign to make customers aware of the impending ban, followed by a fortnight-long "soft" introduction of the policy. The operator stressed passengers' bags would not be searched before or during journeys, and it will be enforcing the ban under existing railway by-laws. "Last orders" will apply on train catering trolleys, with drink not sold from 20:30 onwards, while customers will be asked to finish any alcoholic drinks by 21:00. Transport police officers will be called to deal with passengers refusing to leave trains or behaving inappropriately.